Purchasing a fiber incompatible with your lifestyle can be disastrous. It’s important to familiarize yourself with the most common fibers. • Polyester- Chiefly made from recycled plastic, polyester is relatively eco-friendly, stain-resistant, and very economical. Unfortunately, it also has the tendency to crush under heavy foot traffic. Consider polyester for a low-budget solution where stain-resistance is the main priority, such as a child’s bedroom. • Nylon- Nylon has dominated the industry for years, heralded for its resiliency and dependability. Reputable brands, such as Stainmaster and Scotchguard, have developed special formulas to bolster nylon’s stain-resistance, making it an extremely well-rounded option. Nylon is best used in high-traffic rooms, or in households with pets where the stain warranties can really shine. • Wool- Exceptionally soft and eco-friendly, wool is a luxurious alternative to modern synthetic fibers. Wool retains its shape for decades, making it a lifetime choice. It also has many natural features, such as dirt resistance, high fire retardance, and low off-gassing. However, because of its high absorption capacity, wool is not a practical choice for bedrooms prone to stains or animal fluids. • Triexta- Developed by Mohawk Industries, triexta (also known as SmartStrand) is extremely stain-resistant and luxuriously soft. Like polyester, triexta is composed primarily of recycled material. Unlike polyester, the fibers are specifically engineered to retain their shape. Triexta’s only downfall is its age; it lacks the rapport with carpet dealers and long-term consumers that nylon or wool has established. This fiber is suitable for most bedrooms. Yarn style can have a huge impact on the final design of your bedroom. In addition, each yarn style has its own set of benefits. • Cut-Pile- The most common style you see in homes today is cut-pile. Cut-pile creates a smooth, flat surface that withstands moderate traffic. 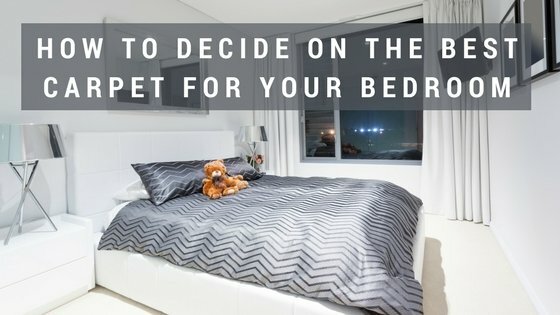 It is an excellent choice if your greatest concern is finding a soft carpet for your bedroom. • Loop- If Aging-In-Place design is your priority, you might want to consider a looped style for its superior performance with rolling traffic. Many shoppers think of looped as the traditional berber. There’s a good reason why: Berber carpet is the king of durability. However, in recent years, looped styles has been given quite an update. While looped carpet will never be as soft as cut-pile, fibers such as wool and triexta have created a far less-abrasive product. In addition, looped is now manufactured with high and low loops, creating stylish patterns that can make a major statement. • Frieze- You may have heard that frieze is the new shag. Frieze is similar to cut-pile, in that the ends are sheared. However, frieze has double the amount of twists and usually has a much longer yarn than cut-piles. Frieze can be an excellent design choice if you favor an informal style, such as chic or retro. You should carefully consider the traffic patterns of your bedroom before deciding on frieze. While new technology has enhanced the twist resiliency of the yarns, frieze still has the tendency to fall flat in areas with heavy traffic. • Cut and Loop- If you appreciate the softness of a cut-pile, but require the durability of a looped construction, consider a cut and loop. Cut and loop is gradually making its way back into popularity with exciting new designs. Cut and loop designs can be subtle or bold, and can easily make a major statement in your bedroom. The styles available are vast: ranging from geometrical, floral, abstract, linear, and even animal print. • Construction- Many shoppers have been inaccurately told that face weight is the most important specification to look for. When dealers advertise heavy face weights at low costs, but don’t be fooled. While face weight can be important, it should not be the deciding factor. Face weight, density, and backing should all be considered before making your ultimate choice. Density is determined by a formula that includes face weight and pile height, creating a much more accurate standard of durability. Generally, a product with at least a density over 2000 ounces per cubic yard should be resilient to matting. Unless you are considering a woven piece, such as wool or jute, typically the backing you see and touch is the secondary backing. Examine the grid and test the rigidity of the backing. If the loops are loose and the backing is flimsy, consider moving on. A loose weave or inferior glue can cause many problems down the road, such as delamination or unsightly wrinkles. High-quality manufacturers specialize in tightly tufted backings that are rigid and contain little fillers. • Padding- Selecting a high quality pad is vital to protecting your investment. Padding absorbs the shock from traffic, adds comfort, and allows you to extract much more dirt and residue when vacuuming. There are several types of padding on the market, such as rebond, rubber, and memory foam. Many professionals recommend purchasing at least an 8lb rebond pad with your new carpet. • Warranties- While a manufacturer’s warranty will not cover wear and tear, it does give you an idea on a floor’s longevity and how well it will function in your home. In addition, ask your flooring dealer about their installation warranty. A reputable dealer should have at least a one year installation warranty, if not a lifetime. • Carpet Flooring Dealers- Although there are many carpet stores in Toronto, not all can give you the quality service and installation you deserve. Research the dealer before signing on the dotted line. A quality flooring dealer will have a history of excellent service, industry affiliations, readily available reviews, and previous project examples. Your salesman should be knowledgeable and more than willing to spend time with you to find the product that suits your needs. After all, this isn’t an impulse purchase; this is a decision you will have to live with for years. Don’t rush to the clearance rack to buy the first cut-pile you see. Choose something that emulates your style, makes a statement, or gives you the luxury you’ve been longing for. Armed with facts and creativity, you can easily filter out all the carpets Toronto has to offer and find the perfect choice for your bedroom.